Do You Need a Business Continuity Plan? 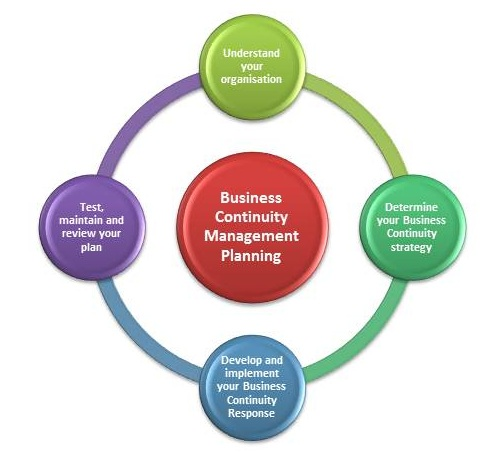 Not sure if your business entity needs a Business Continuity Plan (BCP)? Maybe you think your organization is too small to need such a plan, or you’ve been operating fine without one for years, so why would you need one now? Well, consider this: A BCP can help ensure your business unit can continue operation either during or shortly after a disaster or other emergency situations. Most importantly, it can help ensure the safety of you and your employees. According to businessdictionary.com, a BCP is a set of documents, instructions and procedures which enable a business to respond to accidents, disasters, emergencies and/or threats without any stoppage or hindrance in its key operations. Also called business resumption plan, disaster recovery plan or recovery plan. Deborah C. Miller identifies the following key elements of a BCP in her book, Business Continuity and Disaster Recovery:Getting Started Guide. Risk Management: Consists of identifying security, insurance, vital records, risk identification and reduction, and business impact analysis (BIA). Crisis Management Plan: Protecting the image and reputation of the organization. Emergency Response Plan: Reaction, containment and control. Evacuation Plan: Ensuring everyone’s safety. Disaster Recovery Plan: Restoring systems and processes. Function Restoration Plan: Restoring critical business functions. Maintenance and Review: Scheduled review yearly and ongoing maintenance. Security Policy: Securing the site and people. 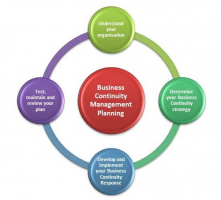 Business Continuity Management: Responsibilities, policies and procedures. Before setting up a BCP, you need to be familiar with how your business operates. You need to know what your organization’s specific mission is and state it in your BCP. Next, determine the applicability and scope of the plan; i.e., state the functions, operations and resources necessary to ensure normal business operations continue or resume quickly after an emergency. Your BCP should contain an updated emergency contact listing/calling tree for all the employees in your organization. This is important so management can reach them during an emergency to determine if they are safe. You must identify your essential business functions and continuity personnel. Be familiar with your organization’s concept of operations for readiness and preparedness. Know the specific steps your organization needs to take for activation of the plan and relocation if necessary. And lastly, designate employees to perform continuity activities. For example, I am the National Continuity Point of Contact (NCPOC) for my business unit and we also have Local Continuity Representatives (LCRs) for every location where we have employees around the country. Pre-identifying orders of succession is critical to ensuring effective leadership during an emergency. In the event an incumbent is incapable or unavailable to fulfill essential duties, successors should be identified to ensure there is no lapse in essential decision-making authority. Orders of succession should be at least three levels deep to ensure the ability to manage and direct essential functions and operations. Designees should be geographically dispersed if possible. Continuity personnel should receive BCP training throughout the year and have updated emergency contact lists to contact employees in the event of an emergency. Conducting quarterly tests and exercises involving all continuity personnel is required to ensure continuity personnel are ready in case a real life emergency occurs. Tests and exercises should include an annual calling tree exercise where continuity personnel and managers call their employees and ensure they have updated contact information. Conduct senior leadership tabletop exercise annually. This serves as a simulation of what the continuity personnel and management would do in a real emergency. Quarterly LCR alerts are necessary to ensure the NCPOC can reach field LCRs in case of a real life emergency. Conduct quarterly tests of emergency communication tools such as Wireless Priority Service (WPS). Document the results of these tests and exercises in your business unit’s BCP and updated annually.